Huge fan of anything potato, HUGE! Mashed, baked, boiled, sweet, fried, french, wedged, hashed, whatever. I don't know why, I really don't, maybe it's the simplicity in taste and how versatile it can be? 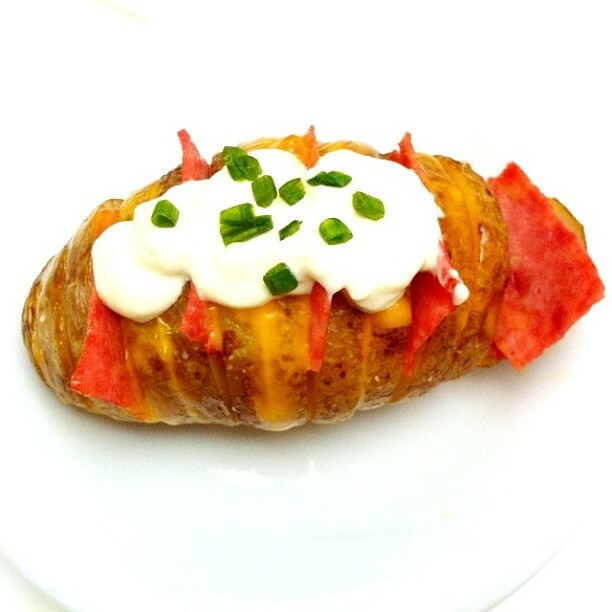 My version of loaded baked potato. The original recipe wasn't mine, found it somewhere on Facebook, the only thing I took from it was the main concept, because I ended up changing up everything when I was cooking the real thing. 3) Cut 1-2 cm slices, without detaching them at the bottom, meaning you only cut 3/4 way through. 4) Spread butter and salt on the potato skin, or in between the slices if you like it flavourful. 5) Pre-heat oven to 170 degree celsius, and bake the potato for 10 minutes. 6) Take it out and put ham/bacon/cheese/whatever you like, in between the potato slices. 7) Put it back to the oven again for 5 minutes. 8) Put more cheese on top if you like the ooey gooey-ness. 9) Top it with cream cheese and some green onions. 10) Serve it while hot! 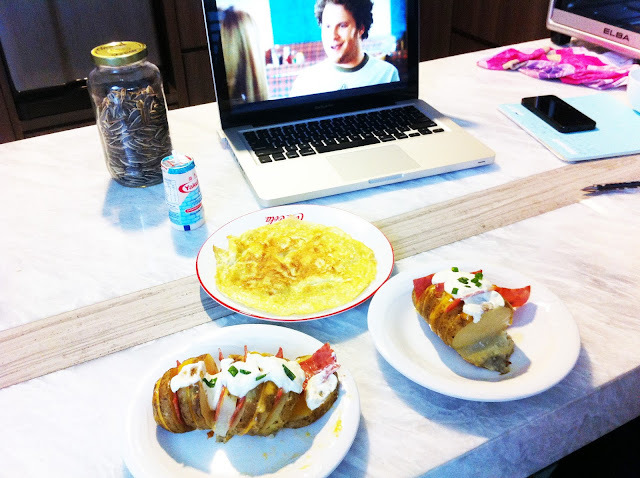 Had it with a perfect plain omelette, and Yakult while watching Knocked Up. Simple yet hearty comfort food. p/s That jar of sunflower seeds isn't mine, funny enough all the people close to me are kuaci addicts.